A number of years ago, PBS aired the first season of The Mind of a Chef – an Anthony Bourdain production, featuring David Chang. As the title suggests, the show gives the viewer wonderful insight into the way a chef thinks, what their inspirations are, and what they’ve been working on. The show is fantastic and any time I feel like I need a shot of inspiration, I put on an episode… or two. Sometimes I’ll even binge-watch an entire season. I’ve always been a fan of instant ramen. As a kid I would crunch up the dried noodles, open the package, and snack on it after school. Even now I have a craving for it from time-to-time. 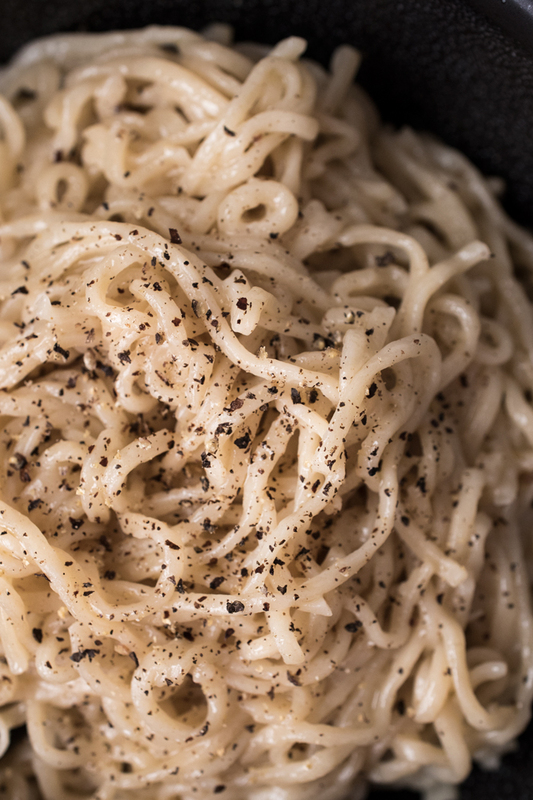 So when I saw David Chang turn the lowly instant ramen package into a incredibly creamy cacio e pepe – I knew I had to try it! So what is cacio e pepe? It’s a Roman pasta dish meaning ‘cheese and pepper’. Back when I was in school, I spent a semester in Florence and cacio e pepe was one of my very favorite dishes! It’s so simply made, but it’s so luxuriously creamy and wonderfully peppery. Chang’s recipe is pure genius! By the time the dried noodles absorb the cheesy liquid, they are al dente (or as close to al dente as instant noodles get), they are creamy, peppery, and so delicious – it took incredible will-power not to eat it all before I could photograph the dish. Check out a clip from Mind of a Chef: here. 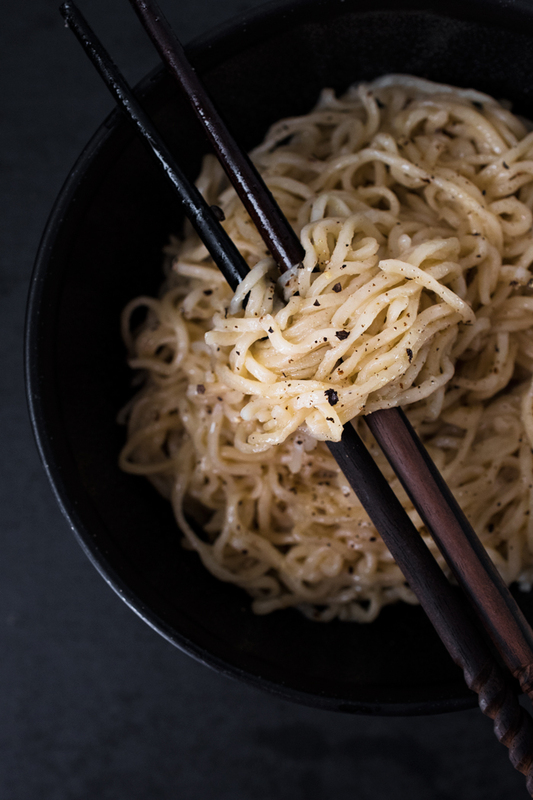 David Chang's Instant Ramen Cacio e Pepe - a genius recipe made in about 10 minutes. In a large sauce pan, bring the water, butter, olive oil, and pepper to a boil. Once the butter has completely melted, reduce the heat to a simmer and add the cheese. Using chopsticks, stir constantly until the cheese has melted. (I found that using chopsticks vs a wooden spoon globs the cheese less). Immediately add the ramen bricks and continue stirring so the cheese doesn't clump. Continue to stir and turn the noodles bricks until the noodles separate. Once separate, you want to constantly stir to develop a creamy sauce, approximately 3½ - 4 minutes. (You can pour some of the liquid out if you're getting close to the 3½ - 4 minute mark and you still have a lot of liquid left). Divide the noodles among two bowls, grind a good amount of fresh ground pepper over top, and some extra cheese if you like. Serve immediately and enjoy! Isn’t the recipe crazy good?! He’s such a genius! I love how simple and delicious this sounds. Sometimes the best meals are those with the fewest ingredients. Yum! I couldn’t agree more, Kristen! Hope you have a very Happy New Year!!! Nice! I always wanted to make Cacio e Pepe- so cool you did it with ramen! Thank you so much, Sabrina. I hope you had a wonderful holiday and Happy New Year!!! Thanks, Natasha! Hope you had a wonderful Christmas as well! We’ve been traveling and it feels good to be back home 🙂 Wishing you a very Happy New Year!!! I really need to check out that show! 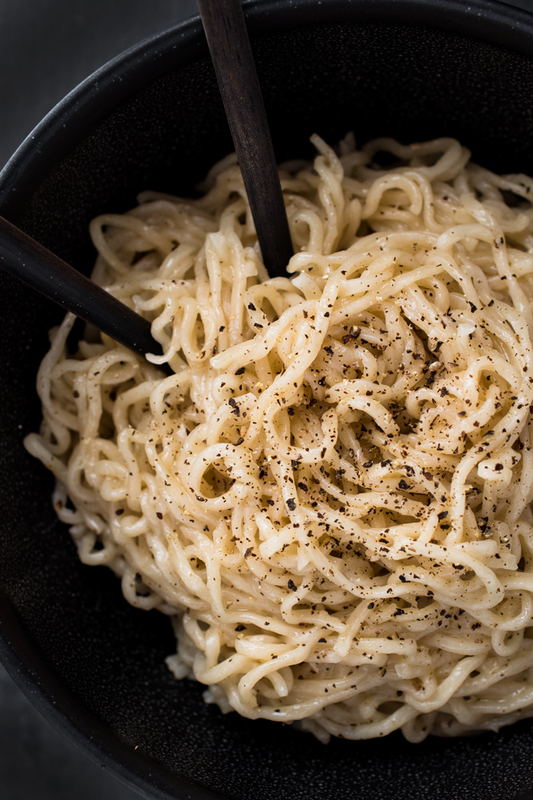 And I happen to love ramen too and this fancy pants cacio e pepe sounds fantastic! You have to check out the show! Each season features a different chef, I know you’ll just love it! This is a really fun idea, Kathleen. Ramen is a lunch fall-back at our house (I love KOYO mushroom ramen). I usually dress it up with bok choy, soy sauce and toasted sesame oil, but I love this Italian fusion twist! I’ll have to check out that show too – I love Anthony Bourdain and David Chang – in fact, even the way that David writes his recipes is pure entertainment. I love the Mind of a Chef show! It’s the best show ever and I just want to hang out with David Chang for a day and go on a food crawl with him. Did you see the season with Magnus Nilsson? Oh man, that guy is absolutely brilliant! Hate to admit this, but sometimes when I watch shows like this, it makes me all teary eyed because the chefs show such a great love for food and customs related to the food. They are so serious and heartfelt in preserving the food’s history, as well as being innovated at the same time. I’m making this ramen dish this weekend! YUMMY! Yes! Omg, Nilsson is incredible too! Forget Hollywood stars, I would be totally star-stuck to see any one of them! I couldn’t have said it better myself – their reverence for food is so inspiring and they’re so freakin’ creative it just floors me every time! Oh it must have been wonderful! I would definitely come out of there in debt – I’d have to order at least one of everything! I used to eat dried ramen as a snack too! And I absolutely love cacio e pepe, so the fact that you paired the two is so so awesome! I am loving this, and I love the Mind of a Chef! Now this is ramen noodle like I never had, and it sounds delicious! This is definitely a creative way to serve ramen. I am a huge fan of Anthony Bourdain. Watched all his shows…A Cook’s Tour, No Reservations, Parts Unknown, The Taste. I was unaware of this particular one that he produced. Need to check it out! Thanks, Kathleen. Oh it’s a fantastic show! One of my favorites from him! Each season they focus on one chef, so you really get to know them and see how they work in and out the kitchen. SCREECH!!! I LOVE MIND of a chef!!! Two of the coolest dudes in food in one show? YES!!! As for this? I’m making it for dinner. Might not be able to wait actually. Might have to have it for LUNCH!!! I think I’ve seen the first season at least 5 times – such a inspirational show! Cracks me up too! Thanks, Mira! I think you’ll really like the show! Oh Kathleen, this ramen looks amazing! So creamy and easy! I will try it very soon. When I was a kid, I also loved to eat dried ramen after school! Haha, I guess most Asian kids do! 😛 I know what TV I will be watching this weekend. Such a simple treat, nicely done! I’ve been wanting to try this, and his ramen gnocchi thing. I looove this show.. was kinda weird about April Bloomfield at first but I’ve come to really like her, and Sean Brock. Have you seen the new season with the azn dude yet? I’ve only watched a few episodes of Mind of a Chef, but I love them. I think I might need to go on a binge-watching session soon! These noodles look so tasty, Kathleen! I made this for dinner last night…as promised, it was delicious….Happy Holidays! Bon Voyage! Ciao! What a lovely and simple noodle dish, so comforting. Have a lovely holiday and Buon Natale! This is such an original, and yet simple, idea, Kathleen. I love it, and yes, now I really want to watch that show! He’s such a freakin’ genius! It just goes to show that some of the simplest and most uncomplicated foods can be incredible! I love the simplicity of this recipe will try….Many many thanks for mentioning “Mind of a Chef” have already added to my netflix list….